A very scarce summer visitor, Buff-collared Nightjar is not reported every year, but most years a pair or two are found, usually in traditional areas. Most Buff-collared Nightjar reports come from May to August, but they have been recorded exceptionally from late March to late September. Apart from a few records from the New Mexico portion of Guadalupe Canyon in the 1980s, Buff-collared Nightjar is found exclusively within the USA in SE Arizona. It is also found along the Pacific slope of Mexico and Central America. Throughout its range, Buff-collared Nightjar occupies a broad range of habitats and elevations, but in southeastern Arizona it is much more specific, preferring arid, lower- to mid-elevation canyons, and main washes in the foothills. 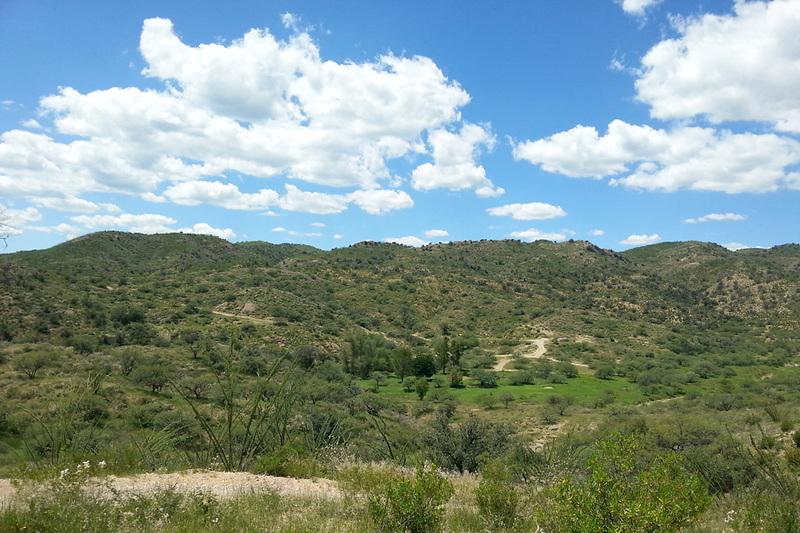 Buff-collared Nightjars breeding in southeastern Arizona appear to require shallow basins, with fairly thick mesquite, acacia and hackberry habitat surrounded by scrubby slopes. 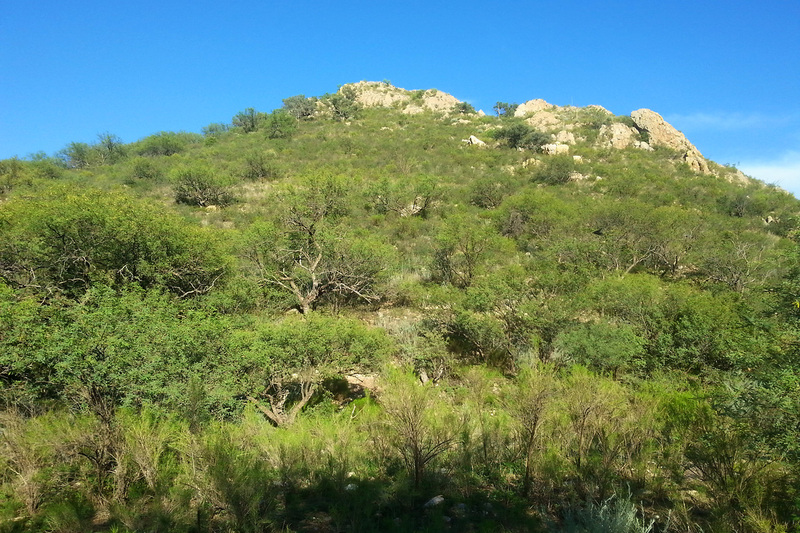 They have also been recorded in open riparian canyons with adjacent mesquite or hackberry thickets. 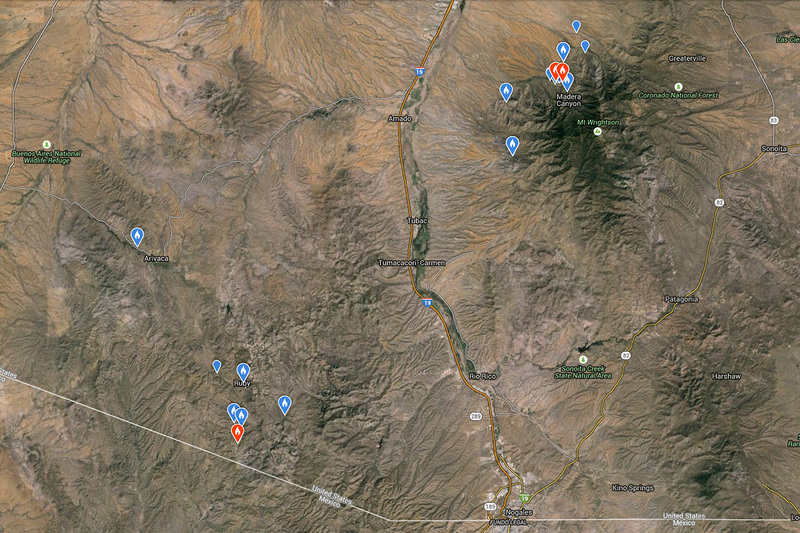 While the majority of recent Buff-collared Nightjar records come from the Santa Rita Mountains, and the Atascosa Mountains/Pajarito Wilderness area, they have been reported as far north as Aravaipa Canyon in Pinal County, west to the Baboquivari Mountains, and east to the Peloncillo Mountains on the New Mexico border. 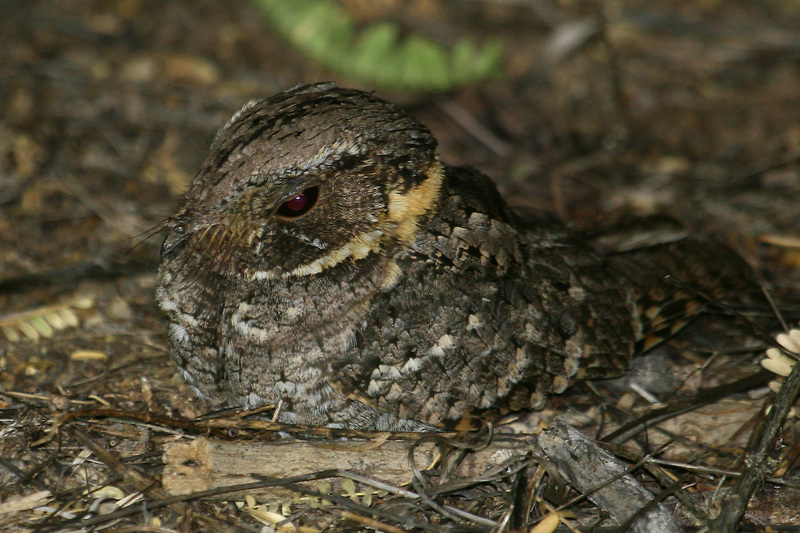 In the Atascosa Mountains and Pajarito Wilderness, the California Gulch area is the most traditional for Buff-collared Nightjar, with records as far back as 1982 at least. 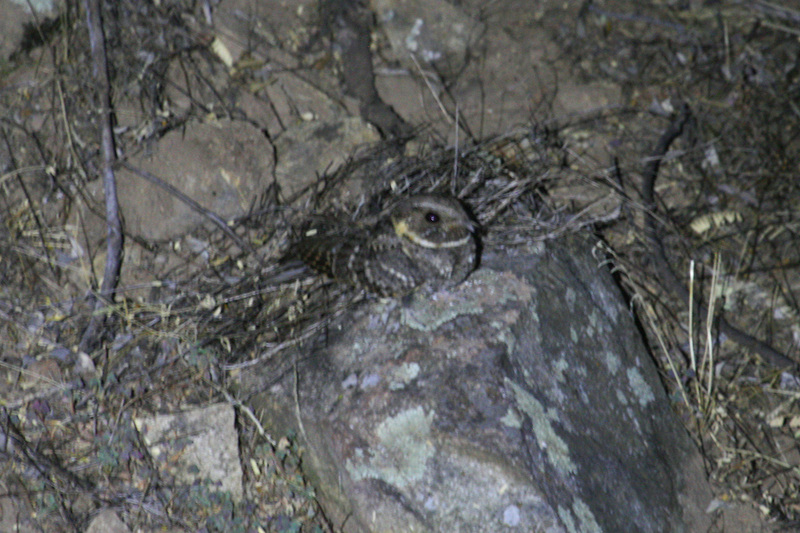 From 2002 to 2009, Buff-collared Nightjars were regular at the Oro Blanco Mine site, just west of the traditional area at California Gulch for Five-striped Sparrow. In 2015, they were regular, and relatively easy to see, a little further south, at the confluence of California Gulch and Warsaw Canyon. 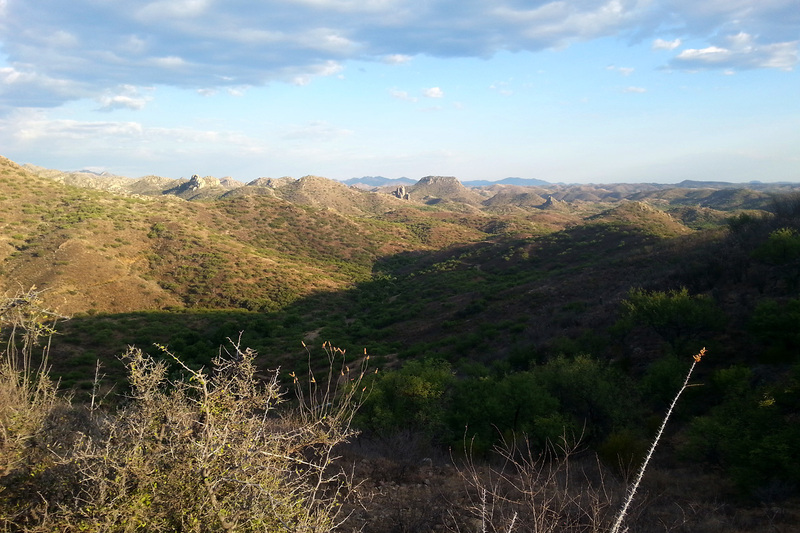 Buff-collared Nightjars have also been recorded along Ruby Rd (1995), at Sycamore Canyon (1996), and Ruby (2012). 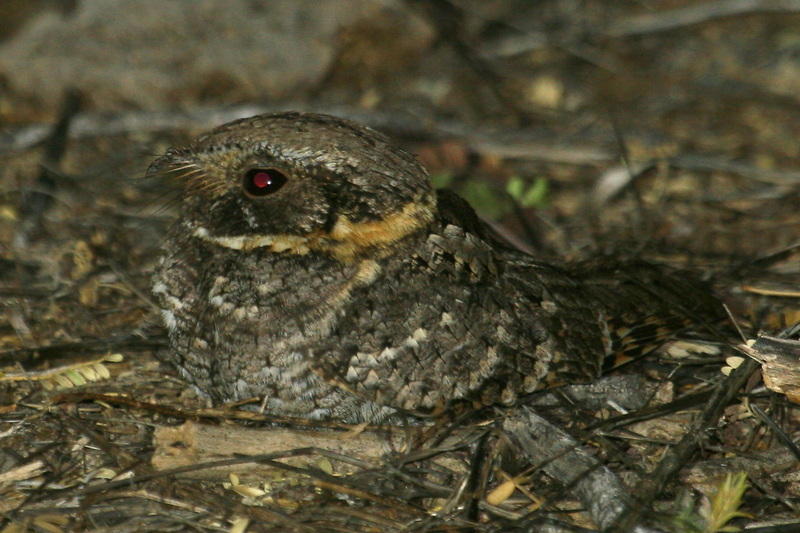 In the Santa Rita Mountains, Buff-collared Nightjars were regular in the Proctor Rd area of Madera Canyon from 1997 to 2004, and then again from 2013 to at least 2015. Another historically regular site is McCleary Wash, where they were present from 1985 to 1994, and again in 2013. 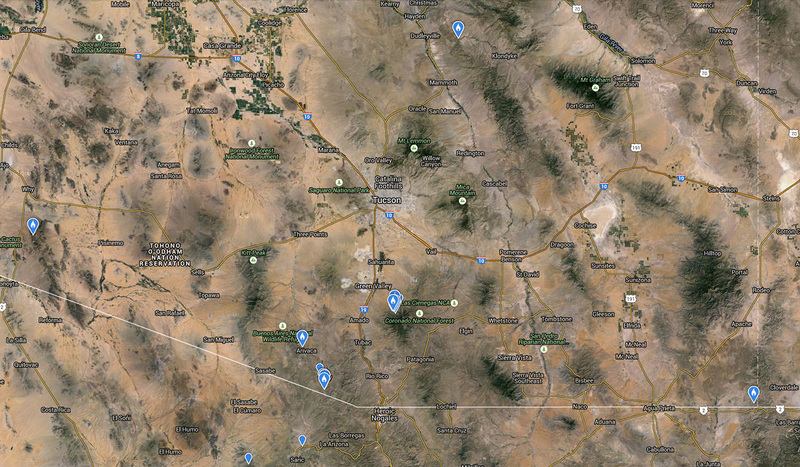 Also in the Santa Rita Mountains, Buff-collared Nightjar records have come from Chino Canyon and north of Greaterville in the 1980s, and Montosa Canyon and Faber Canyon in 2013. The first record of Buff-collared Nightjar in the USA was at Guadalupe Canyon in 1960, with intermittent records until 1990. 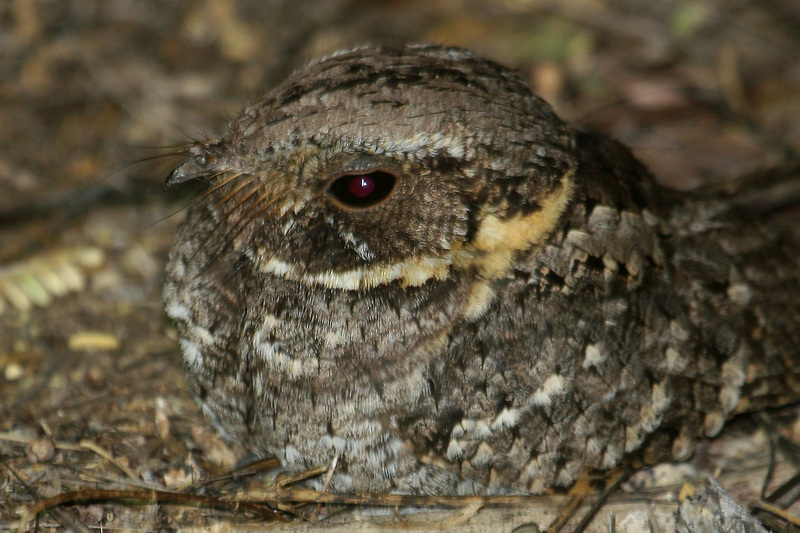 Elsewhere, Buff-collared Nightjars have been found at Arivaca Creek, Brown Canyon in the Baboquivari Mountains, Sonoita Creek, Patagonia in 1971, the Santa Catalina Mountains at Romero Canyon, Catalina State Park in 1978, and Aravaipa Canyon during the 1980s. The best way to hear and maybe see a Buff-collared Nightjar in southeastern Arizona is to pay attention to the latest bird news for recent reports. While they do have traditional sites that they occupy for years on end, these change, and no site has ever been entirely consistent and reliable. If you’d like to discover your own Buff-collared Nightjar, a good knowledge of the traditional sites, and the type of habitat and terrain they prefer, is important. While Buff-collared Nightjar has been recorded singing as early as late March, they normally begin vocalizing in late April or early May, and continue with regularity through June. They tend to stop vocalizing frequently in July, but should still be present through most of August. 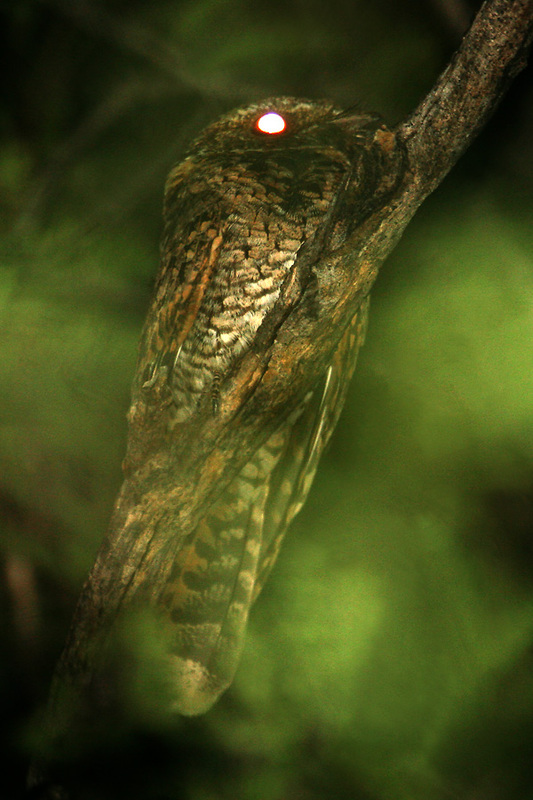 Male Buff-collared Nightjars begin singing just after the sun goes down, and continue usually for the next hour or so. On bright, moonlit nights they may be heard at any time. 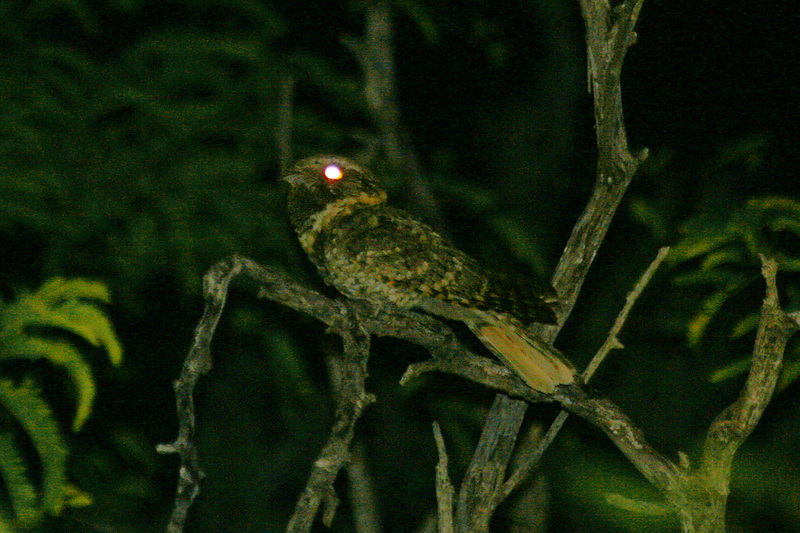 Buff-collared Nightjars will usually vocalize again close to sunrise, and may continue for a while after. 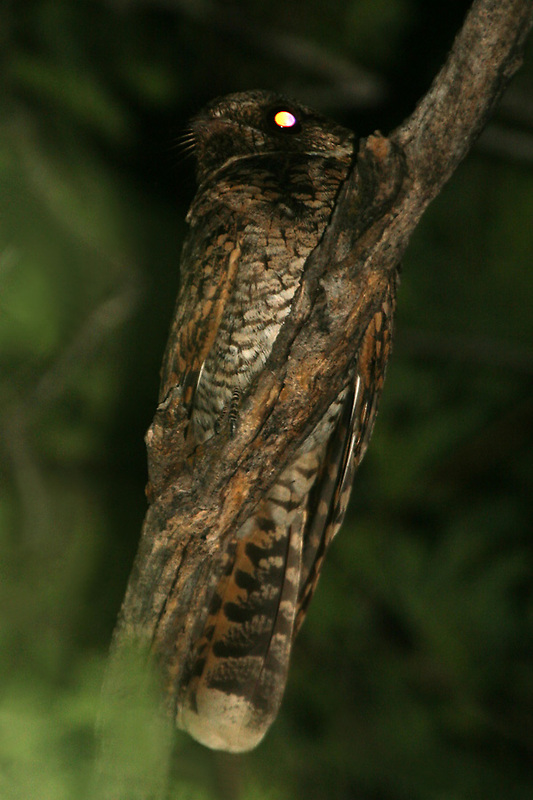 Most Buff-collared Nightjar vocalizations are given from reasonably prominent, low to mid-height, often bare branches in mesquite trees. They will hawk for insects on the wing, and also feed under larger trees, often landing on bare ground or small rocks. 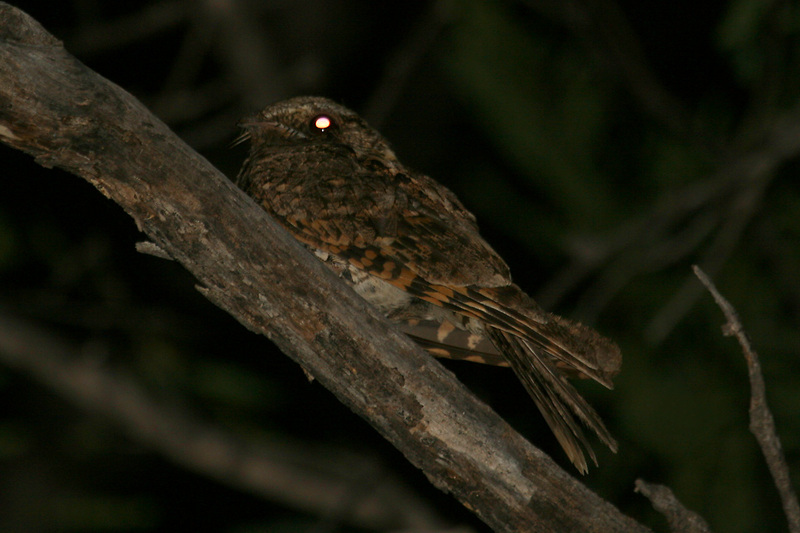 It pays to learn more than just the regular song of Buff-collared Nightjar. They also make a variety of chuck calls and clicks which can be equally useful in locating them, especially after the males have ceased singing regularly. 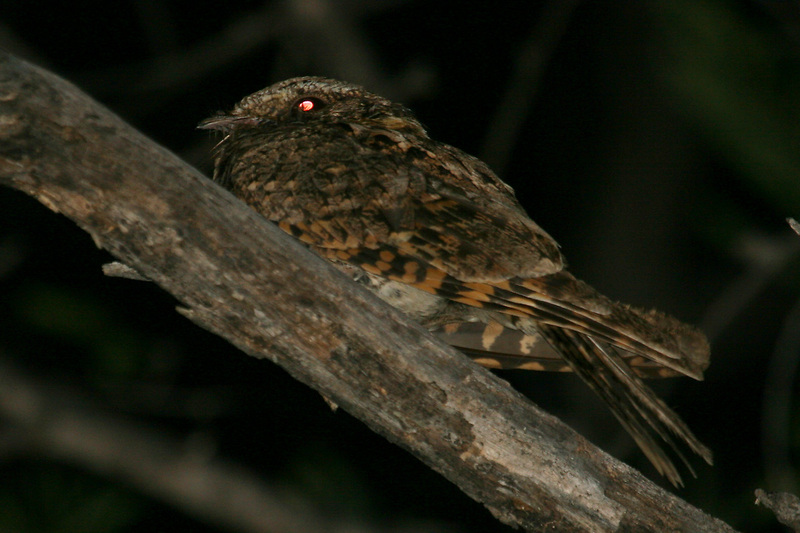 Buff-collared Nightjars go almost completely silent by August, so finding them becomes much harder. The only way to find them at this time is to scan likely perches with a flashlight for eye shine, and watch for birds hunting for insects from exposed perches. Be very careful of imitations! Northern Mockingbirds have been known to pick up the vocalizations of Buff-collared Nightjar and give startlingly accurate renditions. Once you’re sure you’re hearing a real Buff-collared Nightjar, don’t chase it around frantically, but equally, don’t stand in one spot and try to call it in. Your best chance of getting a visual is to slowly and calmly head towards the source of the call, keeping flashlight use and tape playback to an absolute minimum. 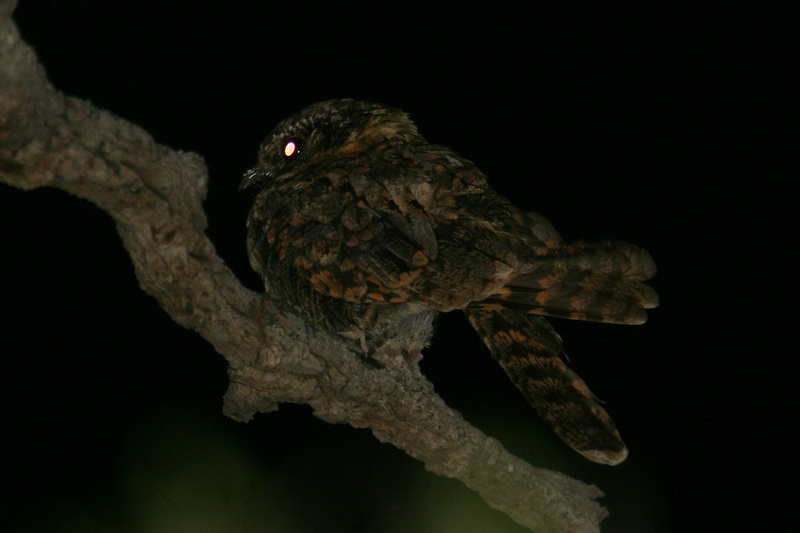 Buff-collared Nightjars seem to have small territories, and are often in the same place, singing from favorite perches. Take a little time, establish the territory, then wait. This will likely be more productive than a scatter-gun approach of moving around, making noise, scanning with flashlights, and playing tapes. Finally, because most birders won’t heed that last bit of advice, the most accessible and popular Buff-collared Nightjars of the summer often become the most difficult to see due to continual pressure. This has been especially true of the birds at Proctor Rd in Madera Canyon in the past couple of years.